The Gone Home Steam page is live! Check it out! GONE HOME ON STEAM! Oh man, that countdown! At this moment, it is approximately 25 hours until Gone Home unlocks on Steam! Give the page a look for minimum system system requirements, screenshots, our trailer… and of course feel free to add Gone Home to your wishlist if you like! 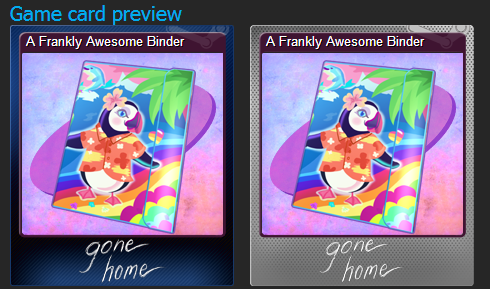 Yes, Gone Home will feature Steam Trading Cards! We were worried about these at first– would they pop up while you’re playing and interrupt the game? 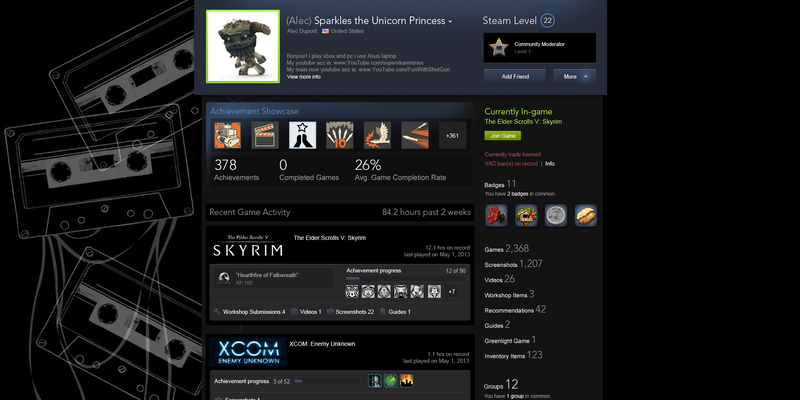 We’re not doing Achievements to avoid just that issue. Would they cause spoilers, or otherwise make the game itself worse? In researching the system, we found that Steam Trading Cards do no cause any popups if you’re playing the game– you just have a notification waiting for you when you exit telling you that you have new inventory items available. And the content of the images and text on the cards is totally under the developer’s control, so they won’t give away anything we want to keep secret. So what did we make for this goofy system? Cards, Badges, Emoticons, and Profile Backgrounds. Kate, our 3D artist and also a talented graphic artist, put together a bunch of gorgeous images for the set. I’ll share a sampling here! So yeah! Check out Gone Home on Steam, and keep an eye on that countdown clock… we know we will be! Look for one or two more posts here before that countdown ends! 4 Responses to The Gone Home Steam page is live! And I was hoping it was 15th August UK time. Well there goes tonight’s one second past midnight feverish click plan. It’s a good thing the “buy” button isn’t active because I probably would’ve clicked it before realizing I should just buy it straight from your website. That binder is tremendous. I love the image of the account you’ve screenshotted. VAC banned, trade banned, horrible English. For some reason it just strikes me as terribly hilarious and out-of-place.